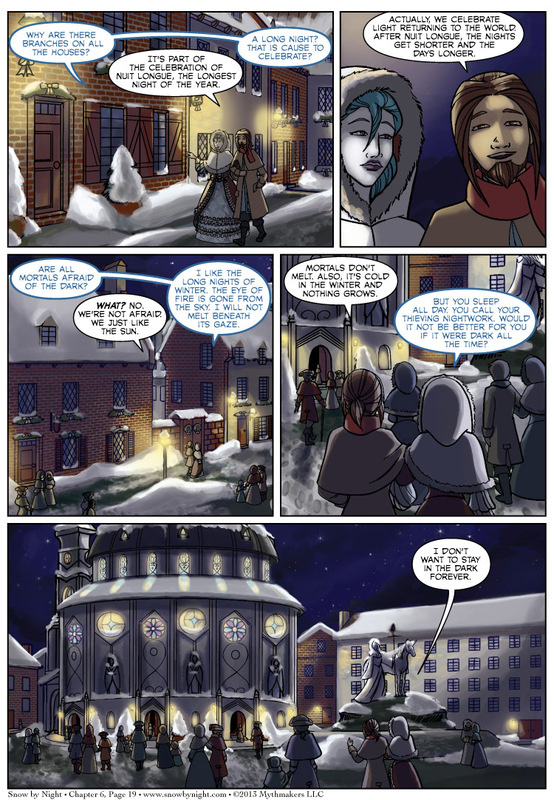 Snow-by-Night and Blaise discuss the merits of sunlight as they make their way to the temple on Chapter 6 Page 19. To see a shot of the interior of the Temple of Giavere from the next page, please vote for Snow by Night on Top Web Comics. Ah Giavere, I’ve purposefully haven’t put her into the Almanac yet because I knew I had this scene from the beginning of the comic. So the Lady of Arts and Sciences will be joining the Almanac this Friday. Brittany and Naty have put together some lovely shots of the temple over the next several pages. I hope you all enjoy them. That background is so good!